Content marketing gives your brand the opportunity to build a deep, long-lasting relationship with its target audience, leading to increased awareness, loyalty and sales. That’s because content marketing sustains attention for far longer than any other marketing activity. And whether it is delivered via print, email, websites, social, video or a live event, content marketing is valued so highly it claims about £1 in every £4 spent on marketing, with allocated budgets increasing at around 25% a year (Source: Content Marketing Association [CMA], UK). Back in 2008, marketing guru and author Seth Godin said that ‘content marketing is all the marketing that’s left’. Fast forward to today, and the effectiveness of content marketing and its flexibility to adapt to every new communication channel is beyond doubt. If you are not exploiting its full potential already, make sure you are not missing out. Econsultancy’s recent trends briefing The Future of Content Marketing revealed that in 2016, 77% of companies were planning on increasing content marketing budgets, with the profusion of marketing, disillusionment with display advertising and the advent of further automation cited as reasons the need for ‘authentic’ content has come to the fore. (Ben Davis, The Future of Content Marketing blog, June 2016). The holy grail of marketing - reaching the right person at the right time with the right message through the most appropriate communication channel - has never been more achievable with the opportunities for improved targeting and personalisation that intelligent application of data brings. In a recent poll more that 90% of CMA members said they were using customer data to inform their content marketing strategies, while 83% revealed they were planning to use data more in shaping their content marketing strategies in the coming year. (2015 Content Marketing and Data Intelligence, CMA). Inspire your audience to spread the word, and you’ll quickly gain a profitable, growing community. MEC Organic Performance carried out a Citation Audit to discover the common denominators that ensure audiences will share their content. Unsurprisingly the most shared content proved to be editorial (32%), followed by CSR / Charity (20%) then Press / News (17%). Content marketing is one of the most effective ways to connect with your target audiences. As the world closes its ears to the hard sell of conventional marketing communications, content marketing cuts through the noise and gets your voice heard. It draws on the tradition of great editorial to influence hearts and minds, helping clients tell authentic stories to their specialist communities - customers, prospective customers, stakeholders and staff. Some brands will choose to create their own content marketing collateral. However we believe that to tell great stories, you need great storytellers. And to deliver them you need innovative creatives and masterful technicians. These aren’t necessarily roles you will find in-house. 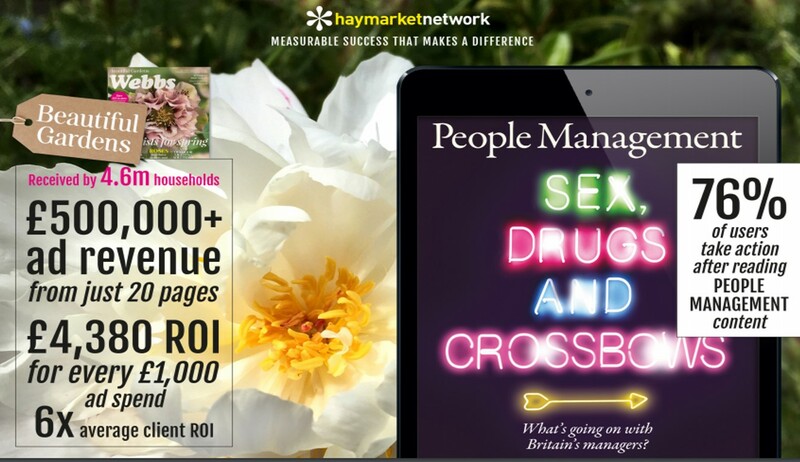 Haymarket Network is a full-service content marketing and digital agency. And if you are looking for solutions that go beyond the anodyne or ‘me too’, we will go the extra mile to develop a deep understanding of your needs and challenges to deliver content that meets your goals. Content marketing is never hard sell. It works by delivering genuinely relevant and useful content to your customers and prospects that adds value to their lives - personal or working. It gives them advice they can trust, information they need or entertainment you can be confident they will enjoy. As a result you benefit from a genuinely profitable relationship that can translate into measurable ROI. Content marketing reaches the audiences you want to attract, engage and motivate into positive action. They may comprise people you have an existing relationship with or they may be the new customers or members you want to acquire. Size doesn’t matter. If you are a mass market retailer, content marketing can connect you with an audience of millions driving footfall through the door and boosting sales online. Or if you are a member organisation wanting to attract the attention of the business elite, content marketing will earn your place in the C-Suite. Whoever you want to talk to, content marketing gives you the voice that will get heard. It’s widely touted as the future of marketing. So get in touch to find out more.